The EZ36 engine was introduced in 2007 as the new power unit for Subaru Tribeca (the EZ36D version). This engine became the largest displacement engine available for Subaru models. The EZ36 replaced the EZ30 engine in 2009 altogether. The engine got the reinforced aluminum cylinder block. The cast iron sleeves have reduced thickness 1.5 mm instead 2.0 mm in the EZ30. The cylinder block height is the same 202 mm. The engine has asymmetric connecting rods (125 mm length). These changes allowed getting more significant displacement - from 3.0 to 3.6 liter. The new aluminum cylinder heads have four valves per cylinder and two camshafts. 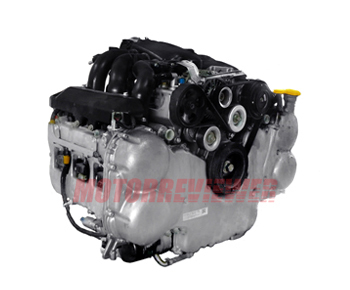 Each camshaft is equipped with variable valve timing system AVCS (Dual AVCS). The combustion chambers in the cylinder heads were redeveloped. The AVLS system, which changes valve lift by engine revs, doesn't exist in this engine. The EZ36 uses three chains. Also, engineers redesigned the exhaust manifolds (headers) and the engine cooling system. This 3.6-liter engine has almost the same problems, which are characterized the 3.0l EZ30 engine. But we can say what the EZ36 is more reliable than its predecessor. The engine life is about 180,000 miles (300,000 km).